Charles Gordon, the man who gave the world Glenfiddich Scotch whisky, has been remembered at international memorial services in New York on February 18 and his hometown of Glasgow in Scotland on February 21. Charles, who was Life President of William Grant & Sons, died in New York on December 21, 2013, aged 86, surrounded by his family after a short illness. Along with his brother Sandy, Charles – or Charlie has he was affectionally known – turned a small, family run company into one of the world’s leading producers of Scotch whiskies including Glenfiddich and Grant’s. A large personality to his family, friends and to all those that he met in the course of his life, Charles’ warmth and charm as well as his unique perceptiveness and long-term vision led William Grant & Sons to the international recognition it enjoys today. He was a key driving force in building the company into a strong independent family-owned company with a unique global reputation for excellence. His son Glenn, the present Chairman of the company, paid this tribute to his father: “We are all very proud of my father’s achievements in his very full and energetic lifetime, and give thanks for the legacy that he has left us with. He touched the lives of many, many people and will be sorely missed by all. In our family and our business, which my father always intertwined, he very much believed in a spirit of partnership. In his memory, we will continue to build this spirit, and with it our independent family business, for future generations”. Charles’ passion and innovative nature led him to launch Glenfiddich internationally which marked the beginning of the single malt category as we know it today, he pushed the global development of William Grant & Sons’ brands, whilst spearheading the acquisition of an American import house, the first of its kind in the industry, moving control of distribution and sale into company hands. William Grant & Sons is an independent family-owned distiller headquartered in the United Kingdom and founded by William Grant in 1887. Today, the global premium spirits company is run by the fifth generation of his family and distils some of the world’s leading brands of Scotch whisky, including the world’s most awarded single malt Glenfiddich, The Balvenie range of handcrafted single malts and the world’s third largest blended Scotch Grant’s. We are fast approaching that time of year that most whisky drinkers enjoy, the festive season. Eagerly planning and scheming on what to not only get for themselves, but what hints to drop as to which whisky would be welcome in their stocking. So I will update my blog as and when I get any festive season whisky news. This will mostly be for the South African market. 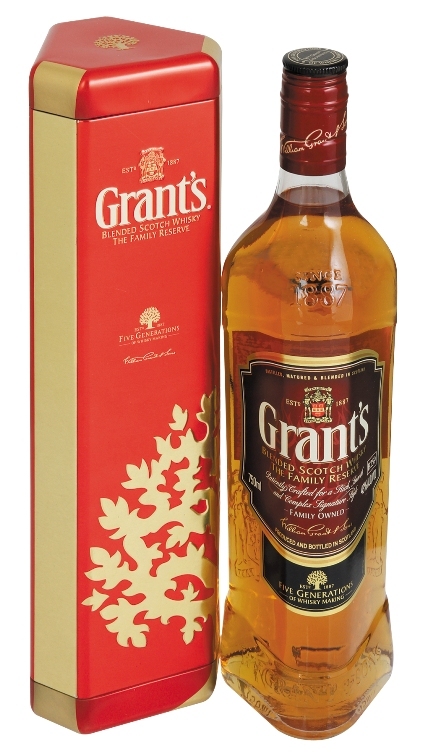 So first up is some great news regarding Grant’s Family Reserve whisky, a blend of around 25 of the finest single malt and grain Scotch whiskies. The basis for the blend is their widely acclaimed Girvan grain whisky. Vacuum distilled at a lower temperature to make it a lighter and more delicate spirit, it is then aged in oak to give it a deeper, sweeter, soft fruit flavour, creating the perfect foundation. One is the Gift Tin, which is exclusive to Spar and Tops stores nationwide. The other is the Grant’s double glass pack, containing Grant’s branded tumblers, making it the perfect way to raise a toast on loved ones. This will be available only at Ultra Liquors, Pick & Pay and Shoprite/ Checkers liquor stores. For more information, visit the Grant’s Facebook page.